Bumping into Deal or No Deal boxes and seeing Goldilocks arm in arm with the bears, have I ambled into some sort of parallel universe? There is only one place you would find yourself in this kind of situation, Bournemouth’s most anticipated event of the year: The Summer ball. With 769 tickets remaining, the Summer ball is fast approaching with the question on everyone’s minds ‘Is it worth it?’ Well, reflecting on the previous summer ball experience it seems the event does live up to its hype. Not just from my opinion, but most of the regular goers if not all are more than satisfied with the evening’s outcome! Summer ball 2009, I was there, as you would have guessed. I felt that buzz looking out into the crowds seeing the most comical and unusual costumes you could ever imagine. Staring down at my own costume, I thought I had the idea focusing on comfort. 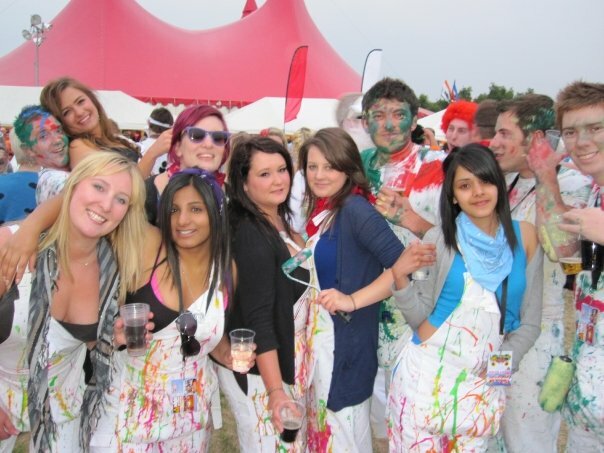 A group of my friends and I went dressed up as painters and decorators, white overalls with paint splashed all over us- which is where the fun started! Waiting in the queue to get on the buses to get to the venue was very entertaining, speaking to a few Gladiators, Rastafarians and Firemen inquiring where their inspiration came from. I was eager to see what the arrangement of this field I’d been hearing so much about would look like. We arrived and the first thing I saw was a sign to ‘nowhere’, which pretty much summed up the random night that followed. The highlight for me was running around in the rain seeing the weirdest and wonderful costumes whizzing past me. It was amusing to see little heads poking through massive foam crayons, nuns and classic characters like little miss sunshine and super Mario (with his little brother Luigi). Evidently the students of Bournemouth University have overactive imaginations and had saved the last of their loans for maximum effort on the costume front. After all, who says three meals a day are absolutely necessary. Performers in the past have always been of quite a high standard. In 2008 the line-up consisted of Jaguar Skills, Pendulum, Scouting for Girls and Subways. The following year, I had the pleasure of seeing Chase & Status- who did get the crowd going I have to admit. But my personal favourite, Ms Dynamite took us back to the old school garage days and represented what she was famed for. Rumours of Chipmunk and Plan B are lingering, though nothing has been confirmed yet, the official line-up will be confirmed at a later date. The one thing that Izzy missed out on was the one thing that everybody does talk about…The survivor’s photo. Self-explanatory, though it is all about pace! 5am in the morning on Bournemouth Pier a photograph of those who have braved the whole night. It’s a challenge every year, where the number increases with more students making it to the end loud and proud! My advice- get your tickets and get them now! It is a great night that has even been compared to festivals like Bestival. The spirits are always high no matter the weather. And don’t think that this night is only for students, I met a good couple of ex students, who are now JP Morgan employees that absolutely loved it. Get your tickets from the Student Union shop or purchase them online at a £1.50 charge. £32 and worth every penny! So, Bournemouth’s biggest ball. Are you in?